Lyle J. Micheli is Clinical Professor of Orthopaedic Surgery, Harvard Medical School, and O’Donnell Family Professor of Orthopaedic Sports Medicine and Director of Division of Sports Medicine, Children’s Hospital Boston, USA. He is Secretary General of FIMS. Fabio Pigozzi is Professor of Internal Medicine and Deputy Rector of the University of Rome. He is the President of FIMS. Kai-Ming Chan is Chair, Professor and Chief of Service, Department of Orthopaedics and Traumatology, Prince of Wales Hospital, The Chinese University of Hong Kong, and a past President of FIMS 2002–6. Walter R. Frontera is Professor of Physical Medicine and Rehabilitation and Professor of Physiology, School of Medicine, University of Puerto Rico. He is a past President of FIMS. Norbert Bachl is Dean of the Faculty for Sports Science and Professor of Exercise Physiology at the University of Vienna, Austria. He is Vice President of FIMS. Angela D. Smith is Clinical Associate Professor of Orthopaedic Surgery, University of Pennsylvania School of Medicine, and former President of the American College of Sports Medicine (ACSM). She is a member of FIMS’ Education Commission. 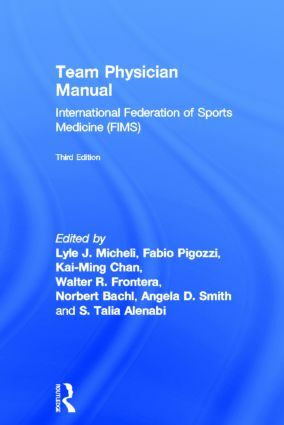 S. Talia Alenabi is Secretary General of the Iran Sports Medicine Federation and a member of FIMS’ Executive Committee.